Escape to your favourite hotel with the Zarina collection of faucets and accessories. Bold lines blend seamlessly with gentle slopes delivering modern style that has a clean and casual look. Impressive geometry and uncomplicated style features give the Zarina collection an ageless yet fashion-forward presence. Tailored yet relaxed, the Zarina collection is an exercise in design balance. This lustrous collection works seamlessly with today's lifestyles. Limited Lifetime Warranty. Call 1-800-465-6130 for details. Elegantly simple, the Glyde and trade; collection's graceful curves and contours flow as beautifully as the faucet's water stream, creating a transitional style that spans a variety of decorating trends. This eco-performance rain shower faucet trim kit is designed to complement the full line of Glyde bath products. Required valve model 2520 sold separately. Zarina Single-Handle Bathroom Faucet in Spot Resist Brushed Nickel Escape to your favourite hotel with the Zarina collection of faucets and accessories. Bold lines blend seamlessly with gentle slopes delivering modern style that has a clean and casual look. Impressive geometry and uncomplicated style features give the Zarina collection an ageless yet fashion-forward presence. Tailored yet relaxed, the Zarina collection is an exercise in design balance. This lustrous collection works seamlessly with today's lifestyles. 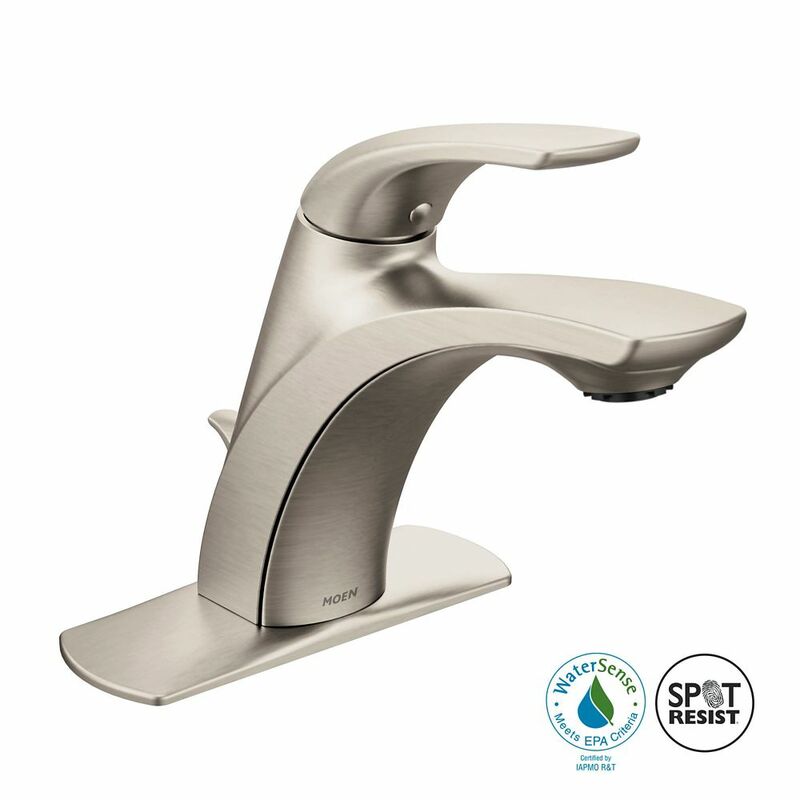 Zarina Single-Handle Bathroom Faucet in Spot Resist Brushed Nickel is rated 4.2 out of 5 by 5. Rated 1 out of 5 by MrResearcher from Plumber couldn't get this to fasten correctly!! I have a 3-hole sink and the plumber couldn't get this faucet to fasten correctly. He said he hasn't had this problem before so I would avoid this faucet. He recommended Delta instead. Rated 5 out of 5 by EMac from Gorgeous and functional Beautiful brushed nickle. Looks, and functions great. Rated 5 out of 5 by Milo from Great looking Easy to install. Elegant looking. The brushed nickel finish does not show water spots. Very happy with the quality of the product. Rated 5 out of 5 by Joner54 from Love everything about this faucet! I bought this faucet for a long awaited bathroom reno. I love everything about it. Its simple design keeps the sink area clean, dry and the very best part is it shows no water spots and wipes off easily. Couldn't be happier. Why are there no Zarina fixtures (towel bar, toilet roll holder, robe hook, etc.) available in brushed nickel? I had these taps installed a few months ago. Now looking for fixtures and disappointed I cannot find them in brushed nickel to match. Do you need to silicone chalk the base? Thank you so much for your interest in Moen products. The L84533 faucet has an o ring provided for single hole install and a deck plate for 3 hole install. No extra sealant is necessary. . If you have additional questions, please complete the form at http://www.moen.ca/consumer-support/contact-us or call Moen at 1-800-465-6130. Our business hours are 7:30 a.m. - 7:00 p.m. Monday through Friday EST.